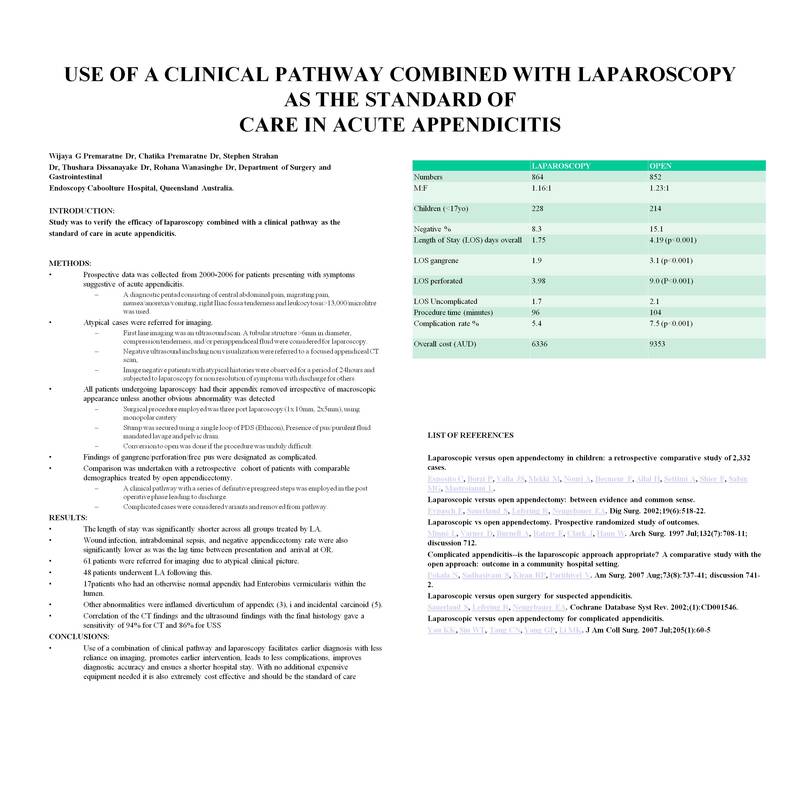 Introduction: Study was to verify the efficacy of laparoscopy combined with a clinical pathway as the standard of care in acute appendicitis. Methods: Prospective data was collected from 2000-2006 for patients presenting with symptoms suggestive of acute appendicitis. A diagnostic pentad was used consisting of central abdominal pain, migrating pain, nausea/anorexia/vomiting, Right Iliac fossa tenderness and Leukocytosis >13,000/microlitre. Absence of any of these was considered atypical and referred for imaging. First line imaging was an ultrasound scan. A tubular structure >6mm in diameter, compression tenderness, and/or periappendiceal fluid were considered for laparoscopy. Negative ultrasound including non visualization were referred to a focused appendiceal CT scan, if positive, directed to laparoscopy. Image negative patients with atypical histories were observed for a period of 24hours and subjected to laparoscopy for non resolution of symptoms with discharge for others. All patients undergoing laparoscopy had their appendix removed irrespective of macroscopic appearance unless another obvious abnormality was detected to account for symptoms. Surgical procedure was three port laparoscopy (1x 10mm, 2x5mm), using monopolar cautery was employed. Stump was secured using a single loop of PDS (Ethicon), Presence of pus/purulent fluid mandated lavage and pelvic drain. No lavage was undertaken in others. Conversion to open was done if the procedure was unduly difficult. Conclusions: Use of a combination of clinical pathway and laparoscopy facilitates earlier diagnosis with less reliance on imaging, promotes earlier intervention, leads to less complications, improves diagnostic accuracy and ensues a shorter hospital stay. It is also extremely cost effective and should be the standard of care.